Paterson (Adam Driver) is a simple bus driver in the city of Paterson, who enjoys his simple routine of driving, hanging out with friends and observing the people he drives through the city. Meanwhile, his wife Laura’s (Golshifteh Farahani) life is always changing, with new dreams coming to her every day. 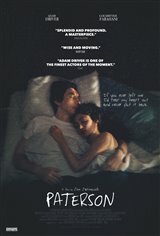 Paterson writes poetry in a notebook but doesn't tell anyone, other than Laura. She encourages him in this pursuit and tries to convince him to turn the poems into country songs, so she can realize her dream of being a country singer.